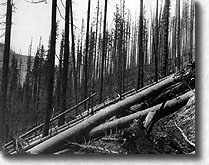 For two terrifying days and night's - August 20 and 21, 1910 - the fire raged across three million acres of virgin timberland in northern Idaho and western Montana. Many thought the world would end, and for 86, it did. Depending on who was doing the counting, there were either 1,736 fires burning in northern Idaho and western Montana on August 19, or there were 3,000. It did not much matter which number you picked because on August 20 it seemed like there was only one fire burning, and it was the sum total of all the others that had been burning the day before. It was called "The Great Lone Land," and those who first rode it for the old Division of Forestry were said to be "hitting the high lonesome." Indeed it was. For as far as you could see, there was nothing but mountains and more mountains, divided by deep canyons, roaring rivers and forests so thick you had to hack your way through them. and those who rode it were called Rangers. Their job was to tame the high lonesome. It would not be easy. On a frosty September morning in 1908, the first District One district forester stepped off the train in Missoula, Montana. Suitcase in hand, he walked briskly to his new office a few blocks away. His name was William Buckhout Greeley, and he would go on to become the third chief of the U.S. Forest Service and one of the most influential men in the history of forestry. W. B. Greeley grew up in California's Carmel Valley, the son and grandson of New England Congregational ministers. Except for Sundays, he spent his boyhood days exploring nearby woods, fishing and swimming in the Carmel River. The Sabbath was reserved for reading The Life of Christ, or a Sunday school lesson laid out for him by his father. Much later in life, he confessed to still having "a terrible New England conscience." He never smoked or drank and rarely swore. Greeley graduated from the University of California at Berkeley, where he became a Phi Beta Kappa scholar and earned honors as a member of the college's debate team. He taught school briefly, but his boyhood love of forests overcame him, and he abandoned teaching in favor of a graduate degree in forestry from Yale University. was in South Dakota and its western edge in northeast Washington state. Between these outer edges stood some of the greatest stands of virgin white pine and western red cedar in the world. So vast was this land that each man under Greeley's command was directly responsible for 600 square miles of wild land, most of it unmapped. In her 1956 book, The Big Blowup, Betty Goodwin Spencer interviewed the last men to first ride the high lonesome for Bill Greeley. Their answers to her questions reveal much about what it was like to work for the U.S. Forest Service when it was all new and still trying to figure out what to do and where to begin. How did you join the Forest Service? of questions pertaining to the knowledge of cattle, horses and sheep, and knowledge of the different brands and locations of ranches and the different ranges where stock were run; also how to cook, the making of baking powder bread and how to take care of oneself in the mountains and woods. The field test included timber estimating, riding and packing a horse, shooting with rifle and pistol, surveying, mapping, pacing a measured distance, cutting down a tree with an ax and compass reading." "My first headquarters was an old guard cabin which hadn't been used since the preceding fall, and in the meantime a family of skunks had made a home under the floor. We got along fine together, but finally the skunks couldn't stand it and moved out I felt real lonesome for some time until a pack rat showed up and filled in the niche in my existence." "Forest guards, rangers and supervisors had to furnish their own horse and equipment, our own subsistence and lodging, feed our horses and pay all of our own expenses, whether we were at headquarters or in the field. Forest guards received sixty dollars a month. The only equipment furnished was an ax, a notebook and a book of regulations called the Use Book." What types of work did you do? "We had a swarm of timber homesteads to check on, and most of those socalled claims we knew to be fraudulent, but it was our job to get the evidence. In the Little North Fork, Marble Creek and Big Creek, we were extremely unpopular as rangers and had to use discretion and diplomacy. We never knew when a bullet might meet us in a thicket or on the trail." How much country did you patrol? "The supervisor gave me a doublebitted ax and a box of ammunition for my 45-70 and told me to 'go to it and good luck.' He said, 'The whole country is yours from Belton to Canada and across the Rockies to the prairie of Waterton Lake and the foot of St. Maries Lake.' It comprised nearly all of Glacier National Park. Instructions were to look out for fires, timber thieves, squatters and game violators. I sure had my hands full and then some." What did you look like, or wear? "Take Ranger F. Herrig, for example. Herrig was originally one of Roosevelt's Roughriders, and quite an imposing figure. He generally rode a dark bay horse, decked up with a silver-studded bridle and martingale. He wore mostly high-topped boots, a big 44 strapped on his belt and a 45-70 in a scabbard, and he wore a ranger's badge always in plain sight, and a big Russian wolfhound was his steady companion." "...I'd been fighting fire up there for two days with nothing to work with but my hands. Skinned both of my knees climbing up there over the rocks. Both of my hands were burnt and skinned, too. My God, I thought, how much longer can I stand it? Got the fire under control. My knees scabbed over and felt pretty good but my hands were in a hell of a shape. Damned if I'll ever fight fire with my bare hands again." By Bill Greeley's count there were three thousand fires burning in his district by early August of 1910, with less than one man per fire to put them out. Equipment was scarce, too. At Avery, Idaho on the Coeur d'Alene National Forest, Cliff Theriault reported his inventory of fire fighting tools included forty hand shovels, ten axes, five crosscut saws, ten grubhoes, four horses, bedding for four men and no supplies. Still, Greeley's men managed to see it through. By August 19, most of the fires were under control. The worst seemed to be over. Then, on Saturday afternoon, August 20, all hell broke lose.Hurricane-force winds, unlike anything seen since, roared across the rolling Palouse country of eastern Washington and on into Idaho and Montana forests so dry they crackled underfoot In a matter of hours, fires became firestorms, and trees by the millions became exploding candles. Millions more, sucked from the ground, roots and all, became flying blowtorches. It was dark by four in the afternoon, save for wind-powered fireballs that rolled from ridgetop to ridgetop at seventy miles an hour. They leaped canyons a half-mile wide in one fluid motion. Entire mountainsides ignited in an instant It was like nothing anyone had ever seen before. By noon on the twenty-first, daylight was dark as far north as Saskatoon, Saskatchewan, as far south as Denver, and as far east as Watertown, New York. To the west, the sky was so filled with smoke, ships 500 miles at sea could not navigate by the stars. Before it was over, 10,000 men were on fire lines that stretched from eastern Washington across the Idaho panhandle well into western Montana. The names of the fires they fought sounded more like the names of Civil War battlefields than anything else: Big Creek, Setzer Creek, Stevens Peak, Storm Creek, Bullion Mine, Cedar Ridge and Little North Fork. In some canyons, you could not tell where one battlefield ended and the next one began. Every able-bodied man fought the fire. 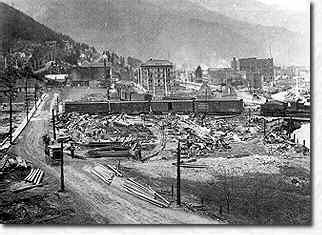 Most were Idaho loggers, miners from Butte, Montana, and skid row bums brought in on trains from Spokane. The pay was 25 cents an hour, plus a bedroll, sourdough pancakes, coffee and canned tomatoes. Even the army was called up, including members of Company G, Twenty-fifth Infantry, an all-black regiment that fought the fire near Avery, then buried the twenty-nine Storm Creek dead in a sixty-foot-long trench. So impressed by them was Ranger Thaddeus Roe that he told a Seattle Times reporter he had "never known a whiter set of men to breathe." What may seem awkward and insensitive now, was then considered a high compliment for men who had fought with the best of them and done as much as any man could. freight train 2,400 miles long. Eighty-six people perished, most burned beyond recognition. When it was over, W. B. Greeley told a colleague he now understood "in cold terms the size of the job" confronting the fledgling U.S. Forest Service. A ranger put one pathetic sight he had seen into words not easily erased from the imagination. "If you could see a little black bear clinging high in a blazing tree and crying like a frightened child, you could perceive on a very small scale what happened to the forest and its creatures." No official cause was ever listed for the 1910 fire. A bad electrical storm the night of July 15 touched off more than 3,000 fires in District One, but by August 19 - the night before the big blowup - the worst seemed to be over. But 1910 was also the driest year in anyone's memory. Snows melted early and the spring rains never came. By August, normally swift?running rivers had slowed to a crawl and many streams had simply disappeared into bedrock. "There was a burning dryness in the air," Orland Scott would recall years later in Pioneer Days on the Shadowy St. Joe, a book he wrote about turn?of?the-century northern Idaho. "Everywhere the heat was intense and stifling." By June, the woods were on fire in a hundred different places. Some of the blazes were started accidentally by loggers, homesteaders and campers. Others were thought to be the work of arsonists. However, it appears the largest single contributor was the newly constructed Chicago, Milwaukee and Puget Sound Railway, which followed the St Joe River east from St. Maries to Avery, Idaho, then disappeared into the densely timbered Bitterroot Mountains, emerging again near Taft, Montana. In a 1911 report, Roscoe Haines, who was acting forest supervisor on the Coeur d'Alene National Forest, estimated more than 100 fires were started by coalpowered locomotives that frequently spewed red-hot cinders into tinder-dry forests. The railroad hired spotters to walk the tracks and douse flare-ups, but as summer wore on the inevitable drew near. Although the 1910 fire was the largest ever to burn in America, it was not the deadliest. That distinction belongs to the Beyond its size, the 1910 fire burned its way into the American conscience as no other fire had done. "Not ever before had a forest fire been given headlines so big or so black," wrote Stewart Holbrook in Burning an Empire. "It managed to burn its way through public indifference and to emerge as what most conservationists consider a charred but positive landmark along the road to forest protection." Journalists of the day took considerable license with the fire. Their headlines were bold, the drama gripping, and - in the style of the day - the details were frequently over-exaggerated. A story in the October 19 10 edition of Everybody's Magazine typified the amplification of real events. "...the poor roasting wretches took many means to preserve from the flames letters, cards, trinkets by which they might be known. Some scraped with the last strength of their burning hands little holes in the earth, put their papers in them, then flung their shriveled bodies down upon the cache to die... "
Ever the opportunist, a politically savvy Gifford Pinchot managed to focus public anger on who he felt deserved most of the blame for the 1910 fire: the United States Congress. "For the want of a nail, the shoe was cast, the rider thrown, the battle lost," he told a reporter from Everybody's Magazine. "For want of trails the finest white pine forests in the United States were laid waste and scores of lives lost. It is all loss, dead irretrievable loss, due to the pique, the bias, the bullheadedness of a knot of men who have sulked and planted their hulks in the way of appropriations for the protection and improvement of these national forests." There is no complete record of how much dead timber was salvaged. The best estimate is about 300 million board feet, less than 10 percent of what was killed. Most of the salvage work was completed by 1918, though the Forest Service did sell some cedar burned in 1910 as recently as 1979. Years later, Elers Koch, who fought the 1910 fire, described the aftermath in a book he wrote about his 40 years with the Forest Service. The fire was only the beginning, he said. Between thirty and forty percent of what burned in 1910 burned again in subsequent fire seasons, destroying a good deal of what had been replanted or had grown back naturally. Where once there had been great forests, there were now great brush fields. Erosion was also a problem. "The fall rains brought down a vast amount of sheet erosion and many steep gullies were scoured out to bedrock," Koch wrote. To make matters worse, "nearly all of the scorched trees were immediately attacked by bark beetles." By 1914, the beetles had moved into green timber. What Koch called "the vicious circle of fire" went on for thirty more years. Most of what was burned black in 1910 is green again; but even now, eighty-four years later, there are still places in northern Idaho where forests that rode ash clouds into the heavens have yet to float back down to earth.